WASHINGTON, DC, July 28, 2017 (ENS) – The House of Representatives Thursday approved the Trump administration’s $1.57 billion budget request to expand the U.S.-Mexico border wall, ignoring threats to protected wildlife refuges and border communities. In a bid to ensure passage, Republicans bundled the border wall funding with a four-bill, $789.6 billion package that includes defense and military construction, and Veterans Affairs spending for 2018. House Republican leaders used a procedural maneuver to unilaterally add the border wall funding to the package without an up-or-down vote on the issue, which could have been a difficult vote for some Republican lawmakers. But the bill sets up a showdown in the Senate. Senate Democrats will not allow such a move said Senate Appropriations Committee Vice Chairman Senator Patrick Leahy of Vermont. If the $1.57 billion in funding for the wall does make it through Congress and is signed into law by the president, work could begin later this year to build 32 miles of new border wall in the Rio Grande Valley in Texas and replace an existing border wall in San Diego, California, just a decade after its completion. Part of the Texas wall would destroy the Santa Ana National Wildlife Refuge, one of the top birding destinations in North America and inhabited by a dwindling population of endangered ocelots. Border wall construction is also planned through or near at least six other protected national wildlife refuges, including two south of San Diego and three refuges in Arizona. “Trump’s border wall fixation now has legs, thanks to House Republicans,” said Brian Segee, an attorney with the Center for Biological Diversity, a national nonprofit organization based in the border state of Arizona. “But they’re underestimating public opposition to this $70 billion boondoggle. Bulldozing beloved wildlife refuges won’t make us safer, but it will enrage people across the country,” Segee said. Segee says the Trump administration is ignoring federal laws that require environmental review and public input before building on public land. Not all House Republicans are in favor of building Trump’s border wall without more on-the-ground facts. U.S. Representative Martha McSally, an Arizona Republican who chairs the Border and Maritime Security Subcommittee, says Congress needs more facts about the current situation along the U.S.-Mexico border. On Wednesday, McSally, a 26-year Air Force veteran, the first female fighter pilot in U.S. history to fly in combat and first to command a fighter squadron in combat, reintroduced her legislation directing the Department of Homeland Security to conduct a full analysis of the current and potential threats along the border. The last complete mile-by-mile assessment conducted by the Department of Homeland Security, DHS, was in 1993, over two decades ago. 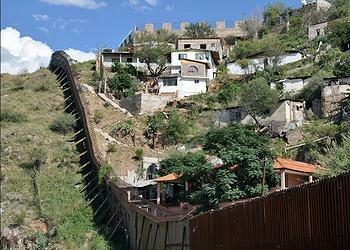 This bill, the Southwest Border Security Threat Assessment Act, was introduced in a previous session of Congress. It was passed by the House on April 13, 2016, but died in the Senate. “DHS’s current state of situational awareness along the border is inadequate and they certainly have not achieved anything close to operational control,” said McSally on Wednesday. “In order for our nation to effectively secure the border, we must first assess the threats that exist, understand and identify the gaps in our defenses and then develop a plan to address those gaps with a blend of more manpower, technology, and infrastructure,” she said. 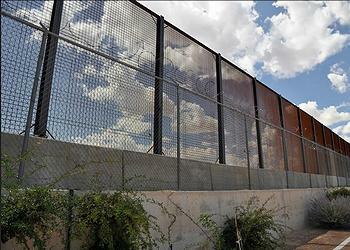 On July 21, House Democratic Border Caucus Co-Chairs, Representative Filemon Vela of Texas and Representative Raul Grijalva of Arizona, sent a letter to House Appropriators expressing their opposition to the FY18 Department of Homeland Security bill, which funds the construction of border walls. In June the Center for Biological Diversity expanded its lawsuit against proposed border wall prototype construction in San Diego. The expansion also challenges replacement of a 14-mile segment stretching east from the Pacific Ocean. The lawsuit calls on the Department of Homeland Security to conduct an in-depth investigation of overall border-security environmental impacts. It challenges the failure of the Trump administration to conduct any environmental analysis or disclose any information about the project. The San Diego border wall was built using waivers from environmental laws issued during the George W. Bush administration. A study by the Center released in May identified more than 90 endangered or threatened species that would be harmed by proposed wall construction along the 2,000-mile U.S.-Mexico border. Critics claim that beyond jeopardizing wildlife, endangered species and public lands, the U.S.-Mexico border wall is part of a larger strategy of ongoing border militarization that damages human rights, civil liberties, native lands, local businesses and international relations.